Today’s homes are filled with high tech electronics and appliances that are engineering marvels but are sensitive to surges, much more so than equipment of years past. In this article, I will explain what a surge is, and how to protect your devices. A power surge, or transient voltage, is a significant increase in voltage above the designated level. For the most part, household and business wiring is 120 Volts with an operating frequency of 60 hertz. If the voltage rises much above 120 volts, your equipment could be damaged. These surges can come from power line fluctuation, downed lines, or problems with any part of the electric company’s power distribution system. Lightning can cause very damaging surges. Surges can also be caused by high-power electrical devices, such as air conditioners and refrigerators switching on or off. I must say, however, in my professional experience spanning over 50 years, I have only encountered a handful of these events that caused any damage. VOLTAGE is defined as the difference of electrical potential between two points. Electric current travels from point to point because there is a greater potential on one side of the wire than the other. A good analogy would be water flowing under pressure out of a hose. Technically speaking, there are two kinds of surges. When the increases last three nanoseconds or more, it is called a surge. When it only lasts for one or two nanoseconds, it is called a spike. A standard surge protector passes the electrical current from the outlet to the electronic device or devices that are plugged into the protector. If the voltage surges or spikes (rises above acceptable level), the surge protector shunts the electricity into the outlet’s grounding wire. 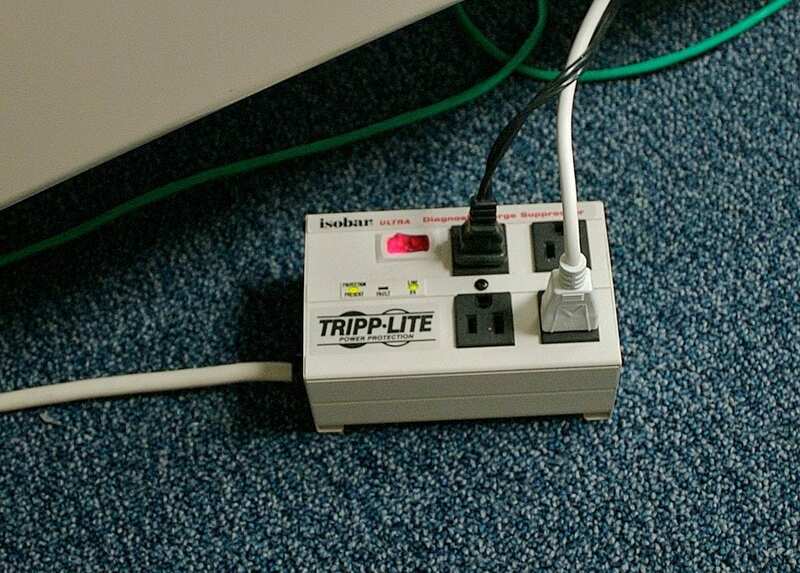 The better surge protectors protect not only from Hot/Line to Ground (marked L-G), but also Hot/Line (marked L-N), and Neutral to Ground (marked-G).The Hot or Line is the wire that carries the 120 volts. The Hot is the left slot on a wall outlet. The Neutral is the circuit that is the return path for the 120 volts, which is directly connected to the center tap of the power transformer out at the pole. Ground is the circuit that is a direct path to Earth ground (literally the ground). This is the small round hole below the two slots on the wall receptacle. The most common type of surge is the shunt or parallel mode protector. In this type of surge protector, there is a parallel path to the regular path of current, which shunts the overload to another wire, such as ground. These types of protectors are in two groups: the ones using MOVs and those using gas discharge tubes. Both of these types of protectors use a parallel design. A few surge protectors use a series circuit design, which means the current is not shunted, but instead is slowed on its way through the Hot wire. These suppressors (protector) detect when there is a higher than normal voltage then stores the electricity, releasing it gradually. This type of protector reacts more quickly and does not divert current to the ground circuit, possibly disrupting the building’s electrical system. They also do not degrade each time they respond to a surge. Uninterruptible power supplies are not really surge suppressors although most have built-in surge suppression. A UPS (Uninterruptible Power Supply) is useful to keep you from losing data on your computer and for keeping any critical device online if you lose power. They are also useful to allow time to properly shutdown your equipment. The surge protectors discussed thus far have been connected directly to the device. Whole house surge arrestors are installed near the electric meter where the power lines run to your building. This protects all circuits in home or office. These units are built for outdoor installation. A good whole house surge protector can handle surges up to 20,000 volts, while standard outlet surge protectors can’t handle more than 6,000 volts. Some high-end arrestors can actually monitor weather conditions and will shut down power to more sensitive electronics when lightning is in the area. Besides providing surge protection for the power in your home or office, all data and signals lines should have in-line protectors on them. This includes phone lines, cables or satellite cables coming in to building, as well as installing in-line Protectors on the HDMI inputs of your TV and audio equipment. UL (Underwriters Laboratory) ratings. You should see 1449 on the UL label. The next thing is price. Anything under $50 (new) is probably not very good. You should also look at the clamping voltage which is the voltage that will cause the surge protector to start shunting current to ground or neutral. There are three levels in the UL rating: 330 volts, 400 volts, and 500 volts. A clamping voltage above 400 volts is too high. Energy absorption/dissipation, measured in joules, is another parameter to look at. A higher number means greater protection. Look for a protector rated at least 400 joules. Six hundred joules or more will afford better protection. Response time is critical, because surge protectors do not kick in immediately and a longer response time means your equipment will be exposed to a surge for a greater amount of time. You should also look for one with an indicator light that tells you the internal components are working. A word of caution about homes that do not have a third hole in the receptacle, which means there is no Earth Ground at the outlet. Most surge protectors shunt the current to ground (Earth Ground). If you have a two-wire system, as is found in many older homes, you will not be properly protected and it can even damage equipment as the surge hunts for a ground path. Even the protectors that protect from L-N (Hot to Neutral) may be problematic. You should only use a series mode (such as a Zero Surge®), which absorbs and releases the energy slowly in to the Hot side. These units, though expensive new, can purchased at a reasonable price on eBay®. The other option is a whole house protector (which must be installed by a licensed electrician). Finally, do not rely on surge protectors for protection from a close lightning strike. A bolt of lightning can contain up to a million volts and 2000,000 amperes. This is enough to melt a surge protector and even vaporize residential wiring. When severe weather approaches, with lighting, you should unplug your electronic equipment and disconnect the signal or data cables coming into the building. ← Do You Remember…Standard Chevrolet?